Welcome to the second publication of Out of this Universe, a monthly publication covering one particular stellar object, from historical discovery to current scientific research, in images and text. The majority of data in these issues are from the scientists, institutions, professonial and amatuer astronomers who have photographed, studied or written about the object under discussion as well as interesting facts or fiction surrounding the object from around the world of astronomy. Our second installment takes a look at an object I've always been fascinated with  Herbig-Haro Objects. I hope you enjoy the following and thank you for stopping in. It was with his small telescope that he began his astronomy career as an amateur observer. He discovered 400 double stars and as a result of the fame thus achieved, was awarded an appointment to Lick Observatory (1888-92) and Yerkes Observatory (1897-1914), where he made hundreds of additional discoveries. As a result of his work he published a General Catalogue of Double Stars within 121° of the North Pole (1906) which contained data on 13,665 double stars, more than a thousand of which he discovered. His work on this catalog spanned 36 years, having begun in 1870 and not seeing release until 1906 when it was published by the Carnegie Institution of Washington. His catalog in now online and may be view at the Google books website  Image at Right: HH255 courtesy Aladin previewer. 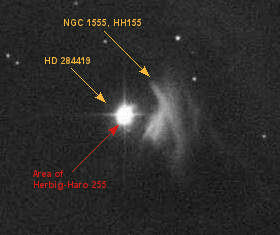 Discovered the first example of a Herbig-Haro object, Burnham's Nebula, now labeled as HH255 (see above), a HII (ionized) region located at RA 04 21 59.4 Dec +19 32 06 and surrounding the star T Tauri. 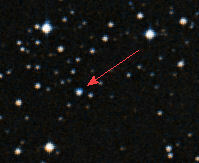 The object was viewed with the 36-inch refracting telescope at Lick Observatory. It was the Soviet astronomer, Viktor Ambartsumian who named the objects Herbig-Haro. His research developed around the young stars and star foming regions with populations only a few hundred thousand years old. His study in this field led him to suggest that these areas, with their associated nebulosity, might represent an early stage in the formation of T Tauri stars. His research into the ideas of protostellar evolution and stellar cosmology were new and ground breaking theoretical developments, supporting the concept that star birth was a continual process, the regions of stellar birth containing new young stars in groups. See also: The Mechanical Universe from Ideas of Comology, the Center for History of Physics, Division of the American Institute of Physics. George Howard Herbig was born on January 20, 1920 in Wheeling, West Virginia. He's an American astronomer who specializes in spectroscopic research into irregular variable stars, notably those of the T-Tauri group. Having studied the spectra of these and other variable stars, he found that many of them contained a prevalence of lithium lines, similar to the abundance of lithium on Earth and in meteorites. He also found the same in the Sun, but of lesser amounts which led him to the conclusion that the abundance of lithium, in both the planetary and T-Tauri, might represent the original level of this element in the Milky Way. Image: Used with the kind permission of George H. Herbig from his personal homepage. In the 1940's George Herbig's survey work had primarily centered on the stars within the area around Burnham's Nebula, the very small star-like patch of nebulosity he saw close to the T Tauri star which was set aside as he continued to concentrate on the group of stars he was surveying. However, he was informed of Guillermo Haro's similar findings and after the two meet and discussed the objects at an astronomy conference in Tucson, Arizona, Herbig conducted further research into the object, noting that these small patches "displayed an unusual electromagnetic spectrum, with prominent emission lines of hydrogen, sulfur and oxygen." Further discovery of "newborn" stars in the region of the Orion nebula and subsequent studies showed areas of nebulosity due to bipolar outflow during the protostellar stage of star formation; this was the same type of stellar object for which Haro's independant research surveys had also found and descirbed. During this same period, a contemporary of Herbig's was busy with his own research work. His name was Guillermo Haro and he had reported the curious stellar clouds of nebulosity around some of the new star forming regions he was then surveying. A graduate of the National Autonomous University of Mexico, Haro majored in philosophy but had also become actively interested in astronomy to such an extent that in 1943 he was hired as an assistant at the newly founded Observatorio Astrofísico de Tonantzintla. Displaying both his enthusiasm and hard work for the science, Haro came to the United States in order to further his astronomical work and education, working at Harvard College Observatory from 1943 to 1944. It is much to the credit of these and other early researchers whom worked hard to bring Mexico's institutions of science into the main stream of modern world astronomy. Seen at right is Herbig Haro 32 from the Hubble Hertiage Site's NewsCenter, article entitled Jets of Material Ejected From a Young Star "HH 32 is an excellent example of a "Herbig-Haro object," which is formed when young stars eject jets of material back into interstellar space. This object, about 1,000 light-years from Earth, is somewhat older than Hubble's variable nebula, and the wind from the bright central star has already cleared much of the dust out of the central region, thus exposing the star to direct view." 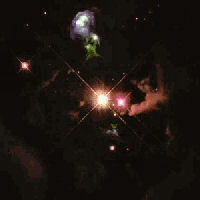 Credit: NASA and The Hubble Heritage Team (AURA/STScI). Image of the Pelican Nebula, Herbig-Haro (HH) Object 555 from the National Optical Astronomy Observatory Monday, October 6, 2003, Release number NOAO 03-08. "Intense radiation from several massive stars located just off the image is eroding the surrounding molecular cloud. In regions shadowed by dense clumps of gas and dust, parts of the cold molecular cloud survive to produce the long "pillars" of dusty material. A faint jet (known as Herbig-Haro object 555) squirts out of the tip of one of the pillars, indicating the presence of an unseen protostar." Clicking on the link above will take to the NOAO website where you can view "a magnified view of a region of the Pelican Nebula that contains several groups of Herbig-Haro (HH) Objects. 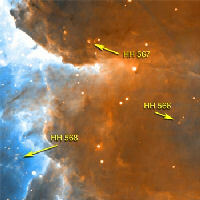 Click a highlighted area in the image to view a magnified version of that part of the image with the HH Objects in that region labeled" Credit: University of Colorado, University of Hawaii and NOAO/AURA/NSF. Astronomers in Mexico, by Vladimir Escalante-Ramírez Ramírez, Vladimir, "Astronomers in Mexico," ReVista, the Harvard Review of Latin America. Volume VIII, Number 3. pp. 48. Spring 2009. "Burnham, Sherburne Wesley" 22 April 2009. HowStuffWorks.com 06 June 2009. "Sherburne Wesley Burnham" 30 April 2009. Wikipedia 06 June 2009. 1. 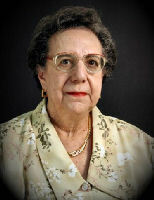 These sisters' are often named in the literature regarding the infant years of astronomy in Mexico ( e.g., Donald E. Osterbrock's William Wison Morgan, Elena Poniatowska's Una preparatoria para Tonantzintla ) yet little information regarding the work they contributed during those early days is available. Writing my frustrations to a long time contributor to this website I was directed to the 2007 publication of Instituto de Astronomía, Universidad Nacional Autónoma de México which has both picture and short ( one page ) biography on Graciela González and the work she performed for science for over sixty years, a period of time certainly deserving of more than a mere footnote. The direct consequence of this has led to the dedication at the top of this page and a planned future publication regarding the lesser known women of astronomy.